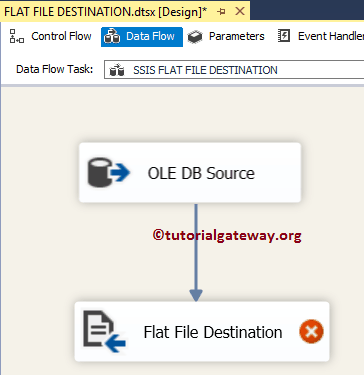 The SSIS FLAT FILE Destination is used to write data to a text file present in the File System. The text file can be in fixed width, delimited, ragged right, or fixed width with row delimiter. 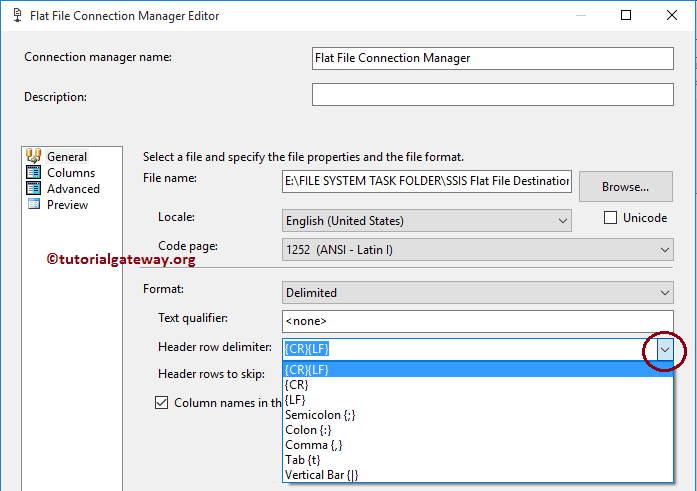 FLAT FILE Destination uses the Flat File Connection Manger to connect with text files in file system. 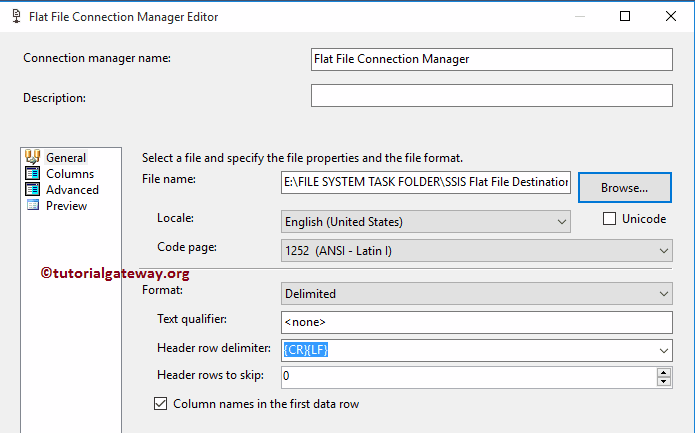 NOTE: The SSIS FLAT FILE Destination uses Flat File Connection Manager to create connection with files. 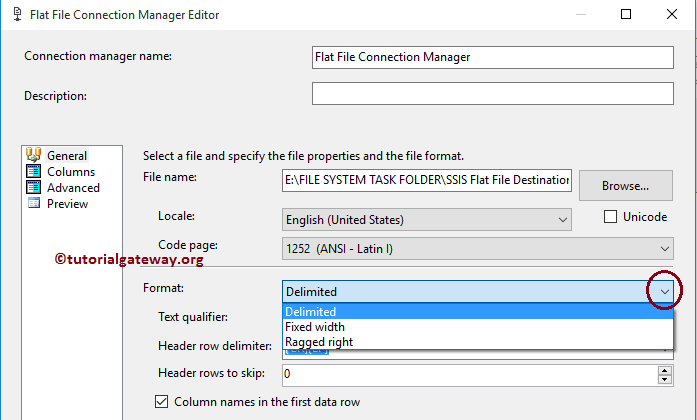 STEP 1: Drag and drop the data flow task from the toolbox to control flow and rename it to SSIS FLAT FILE Destination. Double click on it will open data flow tab. STEP 2: Drag and drop OLE DB Source and Flat File destination on to the data flow region. 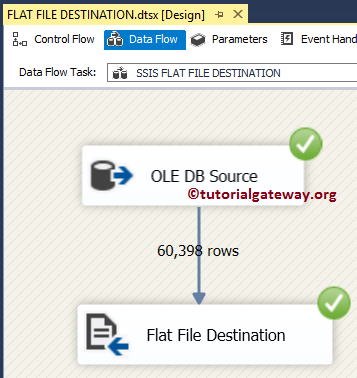 In this example, we will explain only about Flat File destination so, Please refer OLE DB Source in SSIS article to understand the steps involved in creating it. 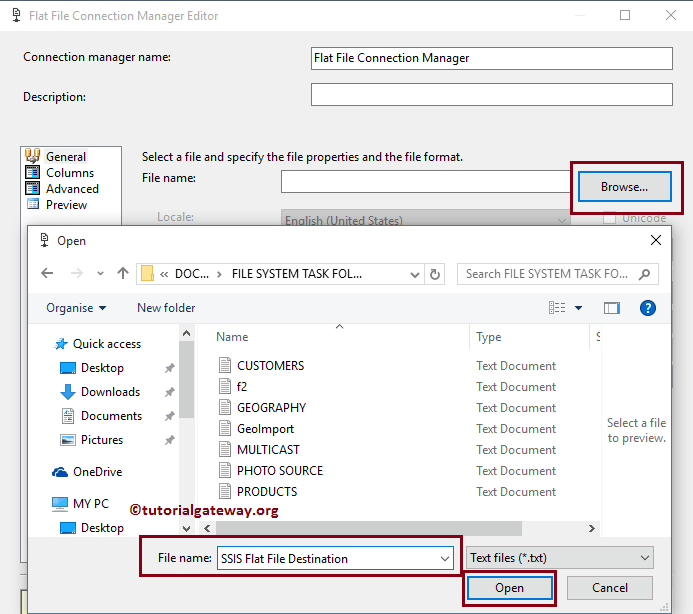 Double click on Flat File Destination in the data flow region will open the Flat File Destination Editor to configure the connection manager settings. 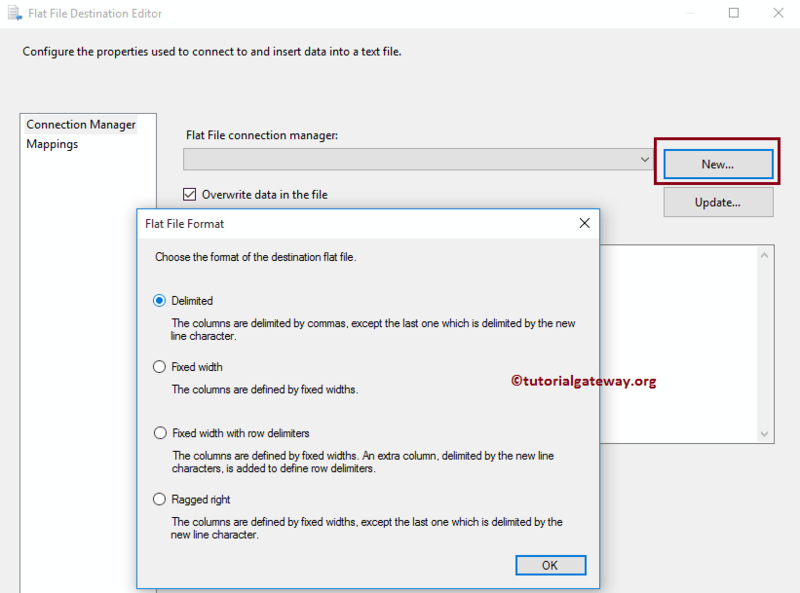 If you haven’t created Flat File Connection Manger before click on the New button and configure it. Once you click on New button, Flat File Format window will be opened. It provides four options such as: Delimited, Fixed Width, Fixed Width with row delimiters, and ragged right. For this example, we are selecting the Delimited option but Please select the option you want to use and click OK button. 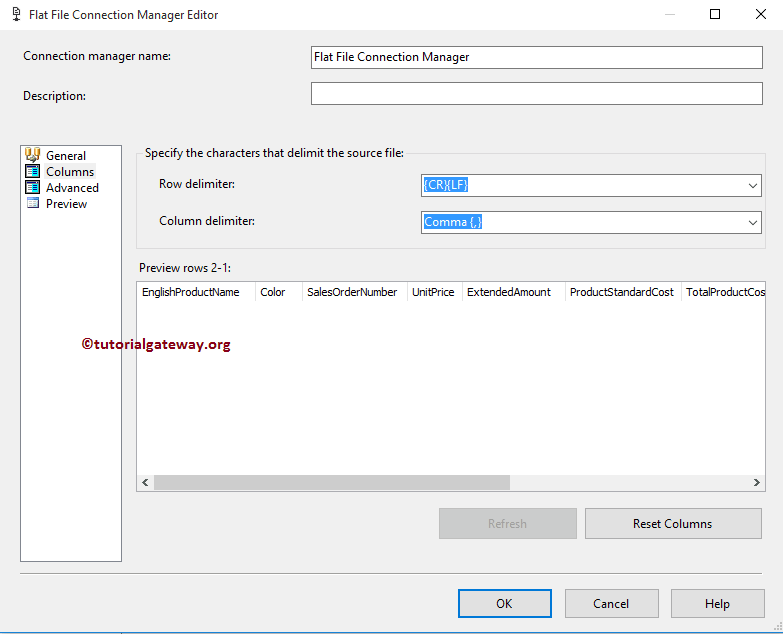 Once you click on the OK button, a new window called Flat File Connection Manager Editor will be opened as shown below. Here, click on the Browse button to traverse the file system and locate the required file. 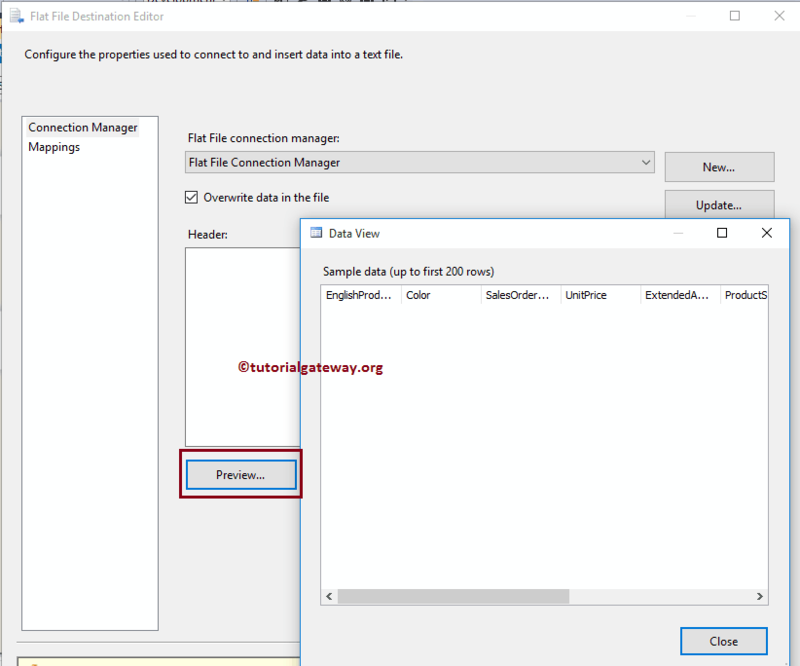 If you select the Existing File option then, select from the file system otherwise, create one. Here, we are selecting the existing file as shown in the below screenshot. Once you selected the file, we have to specify whether our text file holds column names in the first row or not by check marking Column names in the first data row option. Since our flat file holds the column names in the first row, we are check marking the option. If your text file is different then don’t select it. Format: Here you can select the Format you want to use while writing data to the text file. Click on the preview button to see the data preview. Next, please Click on Mappings tab to check whether the source columns are exactly mapped to the destination columns. 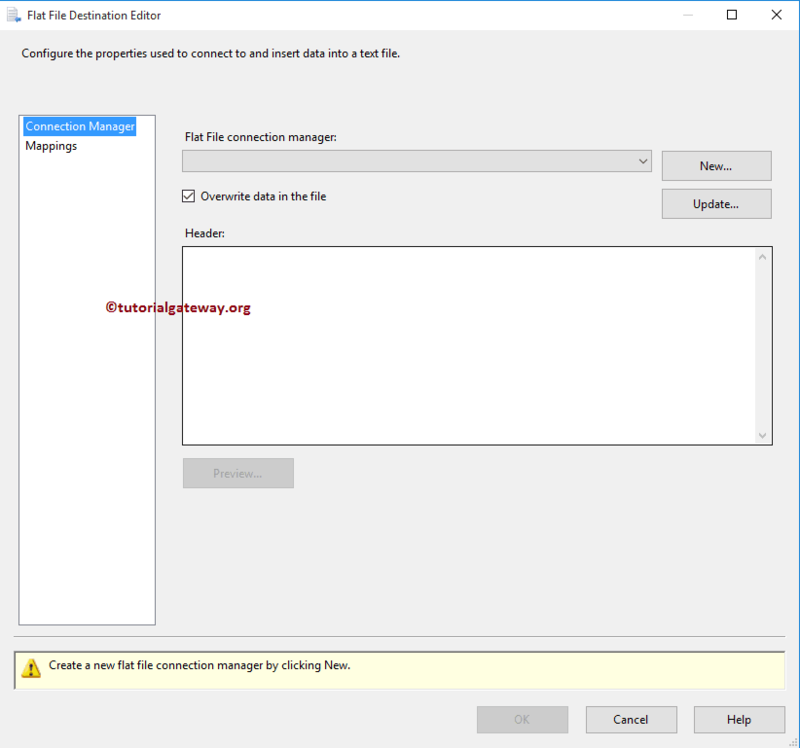 Click OK to finish configuring SSIS Flat File destination package. Let us run and see whether we successfully transferred the SQL table rows into the flat file or not. 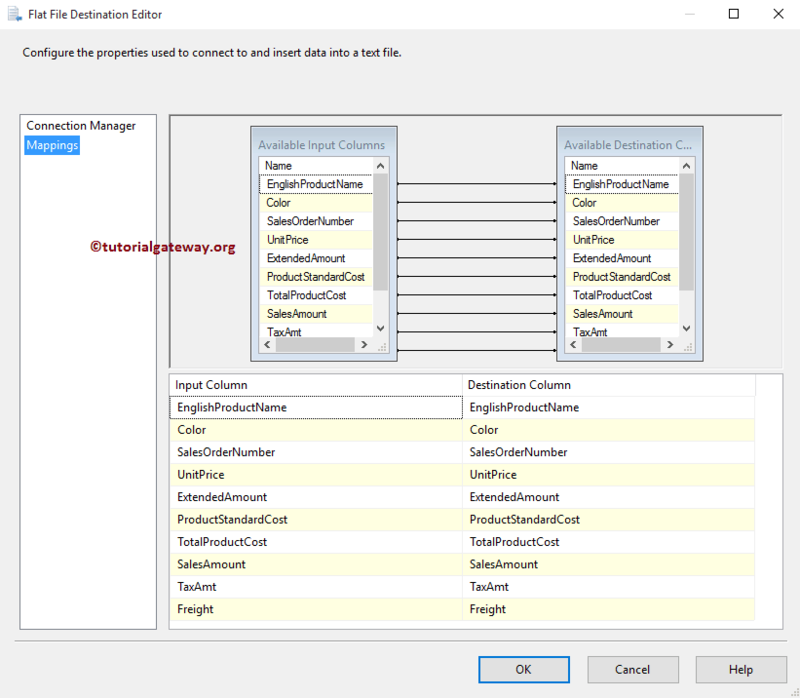 From the below screenshot you can observe that we transferred the SQL table rows into the ssis flat file destination text file.